StitchyDonDesigns: I'm On A Roll !!! I'm On A Roll !!! What's that ? Another finish you say !!! Why yes I do have another one to share haha !!! 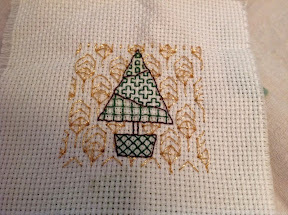 I have finished another small christmas kit I started for my Crazy January 2014 Challenge. Since I won't get any of my other goals finished this year for the challenge I may as well complete all the Smalls !!!! 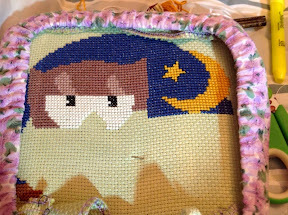 I have also been making some progress on my owl. He now has some eyes !!! That tree is so cute!